In my last post I showed how you can live stream to Twitch from a RetroPie and in this post I will build off of that and show how you can stream to YouTube. The basics of this guide are very similar to the Twitch guide so I suggest you give it a read as I will assume that you already know how to do things like ssh into your RetroPie and work with the config files. 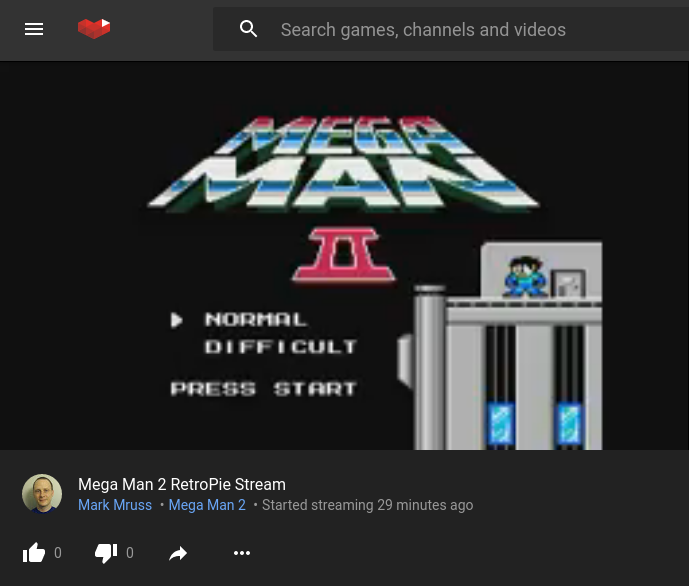 Before you can stream to YouTube you need to have your RetroPie setup to record gameplace. 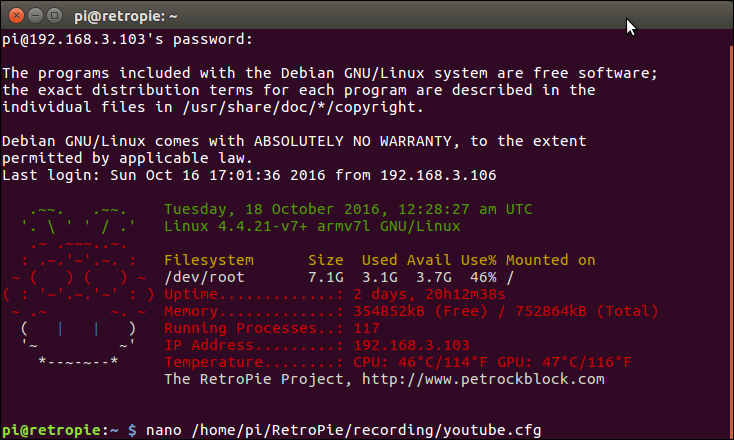 To do so follow the instructions in this post: How To Record A GamePlay Video From A RetroPie. Once that is working come back and get YouTube streaming working. The first step is to get your YouTube live account setup. To do so visit: https://gaming.youtube.com/ and click the “Go Live” button at the top right. If you don’t have a YouTube live account you will be prompted to create one. You will need to press the reveal button to actually get your YouTube Stream key. Keep that around but like your Twitch stream key do not share it with anyone. Then save (CTRL+O) and exit nano (CTRL+X). Note: I’ve noticed that the video quality on YouTube using these settings is a little worse than what I was seeing on Twitch. So they will need to be tweaked a little bit in the future. 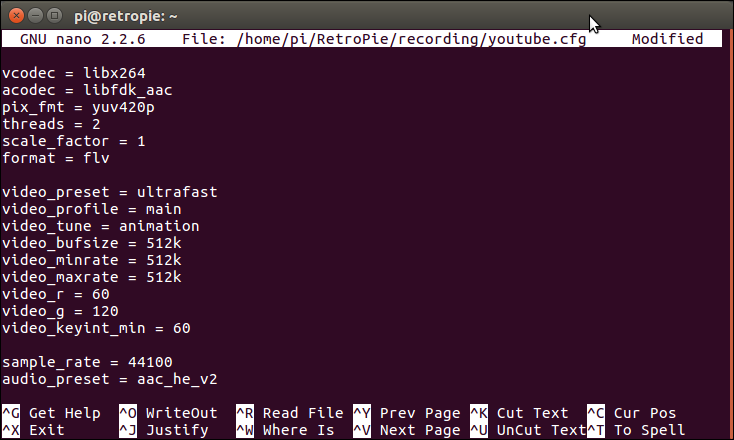 lr-fceumm-record-youtube = "/opt/retropie/emulators/retroarch/bin/retroarch -L /opt/retropie/libretrocores/lr-fceumm/fceumm_libretro.so --config /opt/retropie/configs/nes/retroarch.cfg --record rtmp://a.rtmp.youtube.com/live2/$$STREAM_KEY$$ --recordconfig /home/pi/RetroPie/recording/youtube.cfg %ROM%"
is the YouTube URL we are streaming to and $$STREAM_KEY$$ is the YouTube stream key we got earlier. tells FFmpeg to use the config file we created earlier. 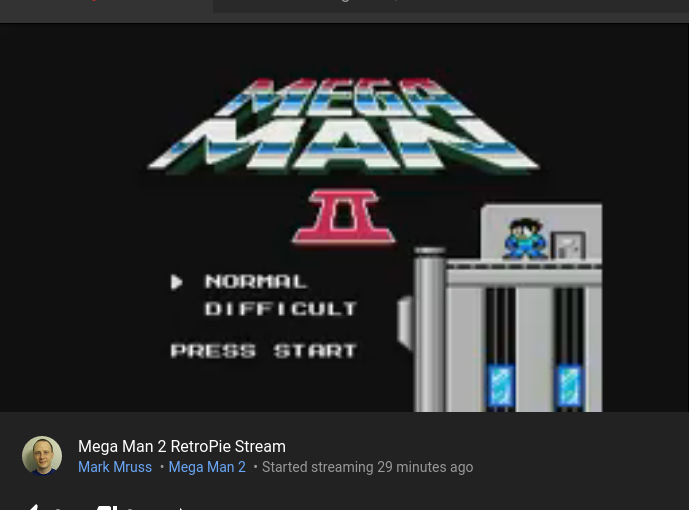 Now that we have everything setup we can stream to YouTube by starting a NES game and then pressing the ‘A’ button while the game is loading. This will load the configuration screen, from there select ‘Select emulator for rom’. You will now see the new ‘lr-fceumm-record-youtube’ entry that we added. Select it (it will now be the default so be sure to change it if you don’t want to stream next time you play) and when you launch the game you should now be streaming to YouTube. Yes, you can check for errors in the runcommand.log file. Hmm which emulator are you trying to connect to YouTube? Maybe share the contents of your emulators.cfg file so that I can take a look at it. Be sure to remove your streamkey when you share it. You have to have ffmpeg setup before you can stream. Finally done! I missed one big article!! thanks sorry for the confusion. No problem, I’m glad you got it to work. I’ve updated the post to make it more clear for future readers. Happy streaming. Hey pal, from your later streams it looks like you figured out better settings for streaming this to youtube. Any chance you can share that with us? Your guides have been a great help, however, I am seeing a pretty low quality output like you mention. Also, is there a way to add a camera to your stream if you are doing it this way? Not sure what to look for online in terms of guides/tutorials on how to do this since most of them have to do with people streaming themselves from their PCs. Thanks again! I have tried to figure out how to do this but I could not. It should be possible but I couldn’t figure out a way to pass some of the additional command line arguments that I needed. Right now my computer is packed away, when I unpack it I will check my latest settings and let you know. Bummer about not being able to put a camera feed in there and thanks for getting back to me.